Version 3.4.6 Improvements and corrections. Version 3.4.5 Adaptation for Linux. Bug on geometrical calculations and formulas whose length exceeds 1024. Version 3.4.4 Switch Radians/Degré. See here. Bugs on reported points. 1. modification of properties of parameters. .CAS files are under zip format, including the Notepad in htm and txt format, the casyopée definitions (casyop.ini) and the maxima définitions (maximastate). .CAS files saved with an older version can be loaded. Undo-redo is possible as much as you wish. Geometrical Parameters instancied by default. French help file updated (English soon). Picture attached to a segment. New fonctioning of parameter's instanciation. 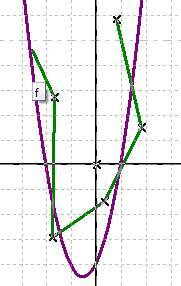 This version allows to import Casyopée constructions made in GeoGebra. This should allow the use of algebraic possibilities Casyopée (geometric calculations, modeling ...) from a GeoGebra figure. Other new features: the min and max functions have been integrated into the numeric evaluator, which makes them usable for functions (graphs, curves) or geometric calculations (approximate value). For a regression other than linear, a curve being drawn, Casyopée offers the possibility to create a geometric calculation "Sum of squares of deviations", of a series of points from this curve (the differences being calculated "vertically). The calculation is created by the Geometric Calculations-adjustment menu. Successively click the points then click the curve to complete. The calculation and its current value are displayed.